Telugu students were allegedly beaten up and their hall tickets torn when they arrived at Hubballi and Bengaluru in Karnataka to take the IBPS and RRB preliminary examination on Saturday. VIJAYAWADA/HUBBALLI : Telugu students were allegedly beaten up and their hall tickets torn when they arrived at Hubballi and Bengaluru in Karnataka to take the IBPS and RRB preliminary examination on Saturday.Kannadiga candidates taking a recruitment exam for probationary officer posts in regional rural banks turned violent and pelted stones at a private educational institute in Hubballi. One of them slashed his forearm.They sought priority for aspirants from Karnataka as the recruitment was being done for banks of the state. The protest started with a few candidates gathering and later swelled as more candidates joined them. 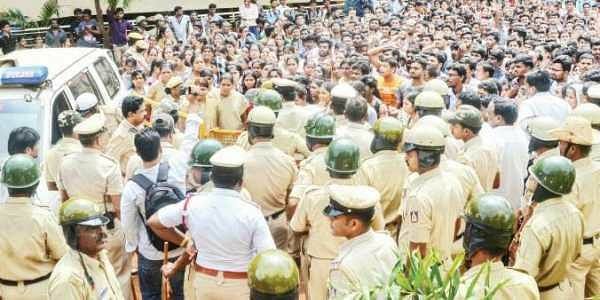 The agitators claimed people from other states were “stealing” their jobs and threatened to go to any extent to prevent them from taking the examinations.The attack on the students has given rise to resentment in AP, forcing Chief Minister N Chandrababu Naidu to instruct the Chief Secretary and the Director General of Police to speak to their Karnataka counterparts to prevent the recurrence of such incidents and see that enough protection is provided to AP students. Naidu said he would take up the issue with Karnataka Chief Minister Siddaramaiah and Union Ministers if necessary. The TDP coordination committee discussed the matter at a meet held at the Secretariat in Velagapudi earlier in the day. “It is cruel to attack students who were there to take examinations. The examinations should be held once again for them. We'll approach the Centre if necessary,”deputy Chief Minister Nimmakayala Chinarajappa said. YSRC chief Jagan Mohan Reddy appealed to the Karnataka Chief Minister to ensure the safety of Telugu students.